Configure File access rules to allow or deny access for this user. 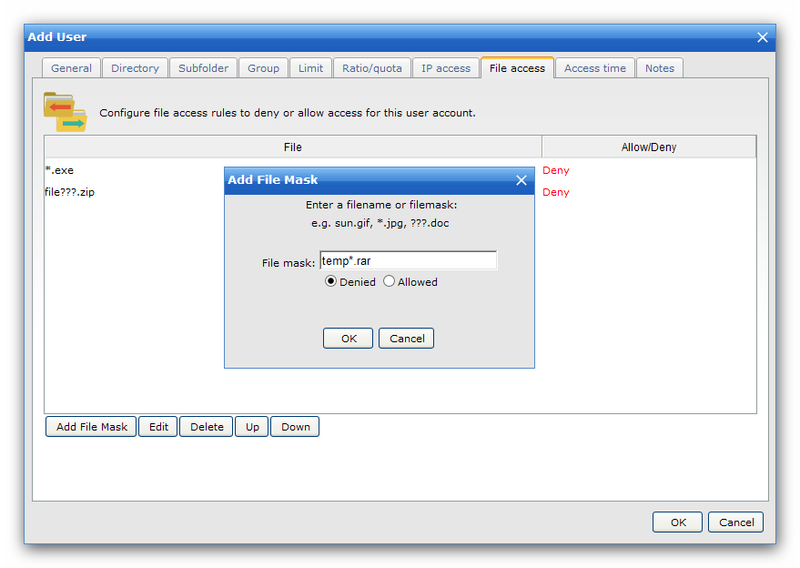 Using this form you can define allow/deny access based on File name for this user account. If you do not specify any file/path, this user can access all the files on the server. But if you set an allow list, the user can only access the files allowed in the list. If you set a deny list, the user can access all the files except those in the deny list. The order of the rules is very important too. Can not access/store any file except *.rar. Can access/store any file except *.zip. The rule list shows the current list and order of file access rules. Rules can be added and removed from the list using the Add and Delete buttons. To define access rules, you can use the wildcards ? and *.